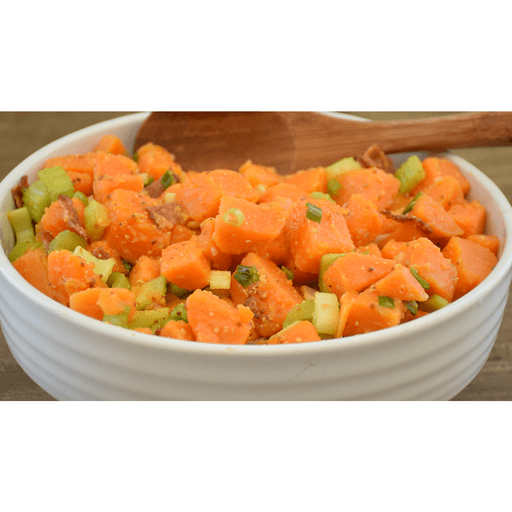 All your favorite flavors of traditional potato salad come together in this better-for-you recipe for Sweet Potato Salad. This recipe skips the mayo and boosts nutrition with vitamin-packed sweet potatoes! 1. Bring a large pot of salted water to a boil, then add the sweet potatoes. Simmer just until fork tender, about 10-15 minutes depending on the size of your potato chunks. Drain, gently and quickly rinse with cold water, then set aside. 1. Add cooked bacon to a large bowl. Add celery and green onions. 1. Prepare the mustard dressing by whisking together the cayenne, mustard, garlic, vinegar, olive oil, salt and pepper. 1. Add sweet potatoes to the bowl with the bacon. Drizzle with dressing and toss gently to combine. Taste and season with additional salt and pepper as desired. Serve warm, chilled, or at room temperature. Calories 170, Total Fat 9g (Saturated 1g, Trans 0g), Cholesterol 25mg, Sodium 470mg, Total Carbohydrate 12g (Dietary Fiber 2g, Sugars 4g), Protein 7g, Vitamin A 180%, Vitamin C 25%, Calcium 2%, Iron 6% *Nutritional values are an approximation. Actual nutritional values may vary due to preparation techniques, variations related to suppliers, regional and seasonal differences, or rounding.